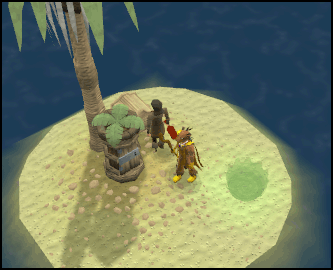 While playing RuneScape, you may suddenly be teleported to somewhere else. If so, you have experienced a random event. 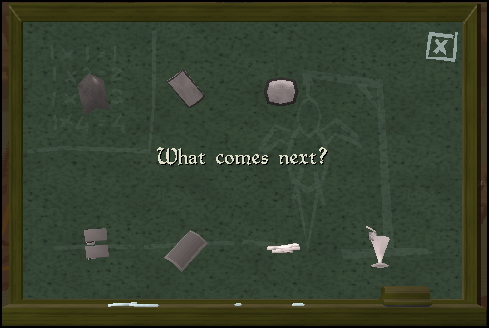 These events are quick puzzles which you must solve in order to leave. As a bonus, you'll receive a reward. These random events can happen to you anywhere, any time. You will be teleported to a different an unknown location to perform a task for a character. Successfully completing these events will allow you to go back to your original location and to get a reward. 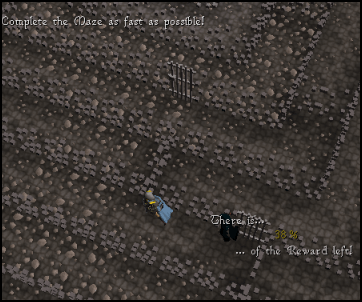 Failing an event will result in your character ending up in another place (maybe even on the other side of RuneScape!) or have a negative effect on your character. Don't worry, if you get teleported to another place, it will never be a dangerous one! If you get a random event on a Bounty World and logout, you cannot log in a PvP or Bounty World again since you will be told you cannot since it is not in Wilderness or Edgeville. You will get a Random Event Gift after successfully completing an event. Players with higher skill totals and/or a good record of completing events will have access to better rewards in the Random Event Gift and will encounter fewer events. Tip: Just pay attention to the game and act quickly when a random event comes. A Beekeeper will teleport you and ask for assistance. He will need you build a new beehive. To assemble the beehive, you must click on one of the four parts and drag them to their designated place. Look at the example to know where they should go. Once all of the pieces have been placed to where they should be, click on Build to assemble the hive. Once you complete it, you will get your reward and be able to leave to your original place. If you fail, a swarm of bees will chase you. To flee, go to the nearest body of water and you will be teleported somewhere else. A pirate named Captain Arnav needs your help to unlock a treasure chest. He will instantly teleport you to an island and your job is to unlock the lock on the chest. To solve the pirate's puzzle, you must match all of the items with the words on the sides. Use the arrow to switch between items and once you get a match, click on Unlock. If you succeed, you get the reward. Leave the island by using the portal. If you fail all five tries, he will teleport you to anywhere on RuneScape. At any moment, one of the three brothers: Miles, Niles or Giles will teleport you into their office. The event is quite simple. One of them will show you a rotating item and a list with three options of what that item could be. Choose the right one and you receive the reward. If you fail, you will have everything in your inventory changed into bank notes. Once you finish, leave the place via the portal. 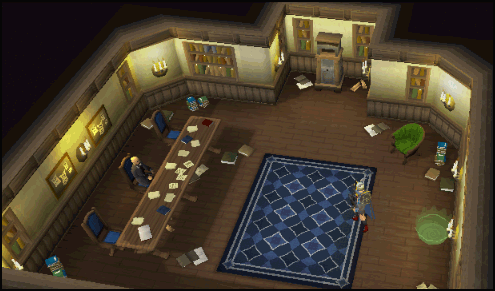 Note: If you have no room in your inventory, there is a Bank Deposit Box which you may use. In this random event, a demon sergeant, Sergeant Damien, will command you to do some exercises. The point of this event is to do the correct exercise by choosing the correct mat. Near the mat, you should see a sign of the exercise. The exercises are Star Jumps, Sit-Ups, Push-Ups and Jogging. Choose the correct mat and you will complete his task. Complete more of these tasks to receive the reward. 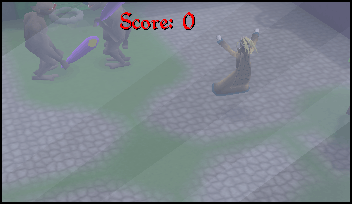 If you fail too much, he will boot you out of the camp and you will wake up somewhere else on RuneScape. 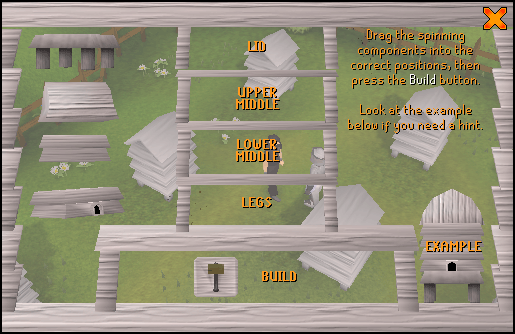 The mats are switched around every time you get a correct exercise. Evil Bob will teleport you to ScapeRune; specifically to an island he calls Evil Bob's Island. Afterward, talk to the female servant. She will tell you that Evil Bob wants fish which will make him sleep. The fish can be found beyond one of four statues. You will watch a scene in which you will see a statue. Remember this statue, as you will have to fish by it. 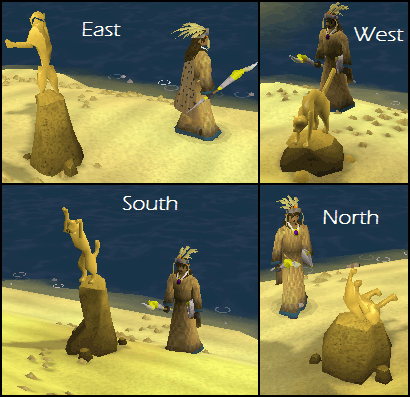 Now, grab a fishing net and head over to the selected statue. Catch a fish in the fishing spot and you will get a cooked fishlike thing. Because you are on ScapeRune, Evil Bob doesn't want any cooked fish. He wants it uncooked! Go to the center of the island where you will see an uncooking pot. Use the cooked fish on it and you will receive an uncooked fish. Give the uncooked fish to Evil Bob and he will fall asleep. You are finished! Leave via the portal. Poor Molly! She has been blamed for crimes done, not by her, but by her evil twin sister! This is your chance to stop her and get a reward doing so. Molly will teleport you to a room. Talk to Molly. She will tell you that she has contained some suspects, but doesn't know which one is the evil one. You must find her. Molly's evil sister looks identical to her. This is your only clue as to who it is. After you have finished talking to her, go out through the door and use the controls to pick the right suspect. The joystick can move in four directions (Up, Down, Left, Right). Move the joystick to which direction you want to go until you position the crane on top of your suspect. Once you have it, quickly press on the button (If not, she will walk away). She will then be put into a cage. If you happen to pick the wrong suspect, you will get one last chance. Once you put the evil twin in the cage, go talk to Molly. She will be very glad and will reward you. 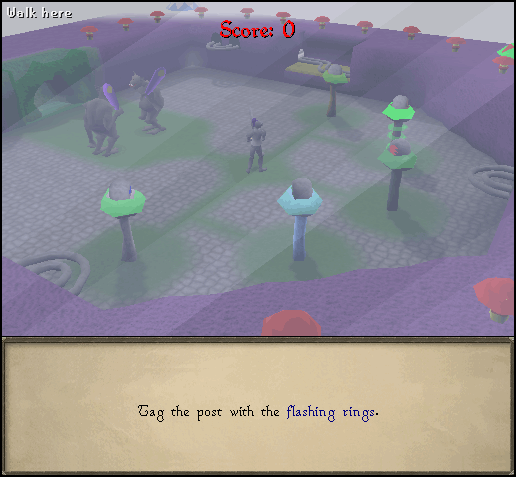 If you miss both tries, Molly will teleport you to a random place in RuneScape. Note: Molly changes appearances every time you visit her. 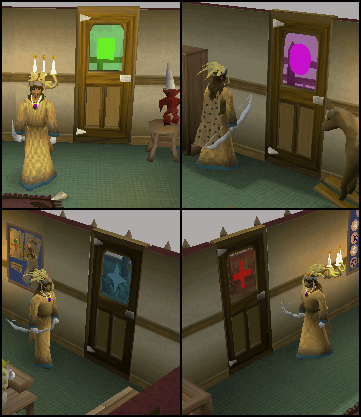 During this random event, The Freaky Forester needs your help so he will teleport you to a forest part of RuneScape. To complete this event, the Freaky Forester will ask you to kill a pheasant with a specific number of tails. Kill the pheasant and bring the raw pheasant back to the Freaky Forester. Once you give him the correct raw pheasant, he will thank and reward you. However, if you give him the wrong pheasant, he will teleport you to a random spot on RuneScape. To leave the forest, use the portal to return back to your original place. Some frogs are in need of assistance. A frog prince/princess needs help to turn back into a human. They will teleport you to a place they call, the Land of the Frogs. Go speak to the Frog Herald to receive your instructions. He will tell you that the frog prince/princess needs help. 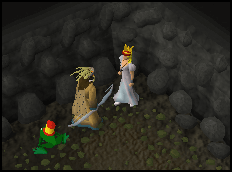 If you talk to a frog other than the frog prince/princess, he/she will get very angry and boot you to a random place in RuneScape. The frog prince/princess will then explain that he/she is under a spell and he/she needs a kiss to return back to human. If you are male, you will kiss a frog princess and if you are female, you will kiss a frog prince. Once you kiss the designated frog, the frog will turn human and give you your reward. 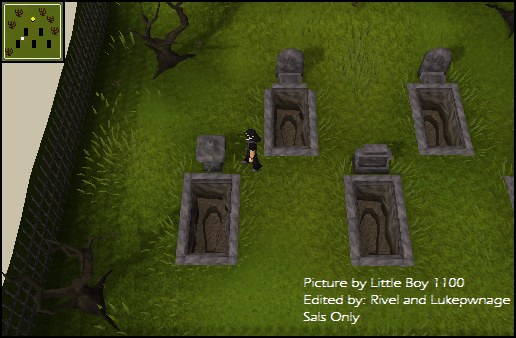 Leo the Gravedigger might show up and teleport you to a graveyard with five graves, each of which contains a coffin. Leo's problem is that he has misplaced the coffins in the wrong grave, and your job is to put them in the correct one. To start, one at a time, dig out all of the coffins and inspect them. While inspecting them, you will get a screen where there are bones and 3 objects that describe the person who deceased. 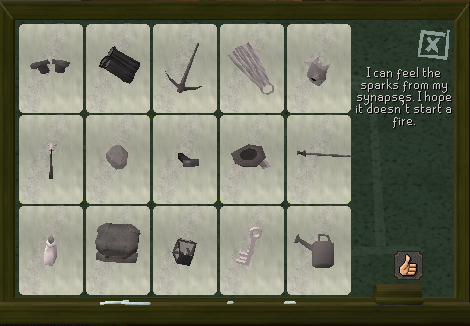 The objects all belong to the same skill (Cooking, mining, farming, etc). After you have done this, read the gravestones. They will tell you who should go in this grave. 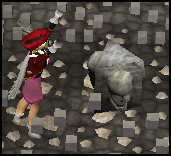 Reading the gravestone will have you get a picture of a symbol of the skill of the person (A Pickaxe for mining, a hatchet for woodcutting). On the gravestone, you will see a plant pot. This is the symbol for Crafting. In the coffin, the three objects that show that he was a crafter are: the bowl, the pot and the flowerpot. On the gravestone, you will see a watering can. This is the symbol for Farming. In the coffin, the three objects that show that he was a farmer are: the seed, the pair of secateurs and a seed dibber. On the gravestone, you will see a hatchet. This is the symbol for Woodcutting. In the coffin, the three objects that show that he was a woodcutter are: the logs, the axe and the knife. On the gravestone, you will see a chef's hat. This is the symbol for Cooking. In the coffin, the three objects that show that he was a chef are: the cake, the chef's hat and the kebab. On the gravestone, you will see a pickaxe. This is the symbol for Mining. In the coffin, the three objects that show that he was a miner are: the ore, the apron and the pickaxe. Finally, after you finish identifying which coffin goes into which grave, it's time to finish the event. Use the coffin with the corresponding grave, which you've identified, for all of them. After you have completed that, go talk to Leo. He will look at the graves to see if they were successfully positioned. If they are, he will congratulate you, teleport you back to your original place, and reward you with a gift box. However, if you failed, you must complete them until you finally get them correct. If you do not have enough space in your inventory, you may store your items in the Mausoleum. 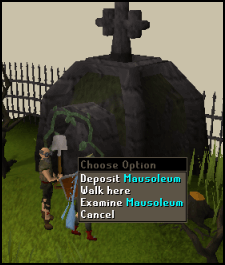 By putting items into the Mausoleum, they will be sent to the bank. Having said so, don't put items you will need after you complete the event since you won't be able to retrieve them unless you go to a bank. 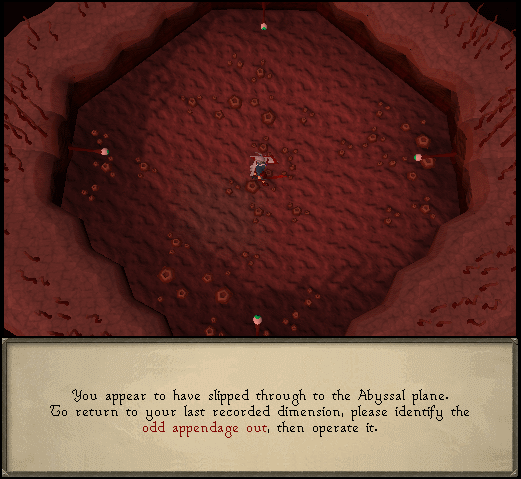 In this event, you will be teleported to an abyssal surrounding. You must find out which lever out of the 4 levers is different than the others, and then operate it. The levers may be different by their color, position, etc. If you choose a wrong lever, you will have your Magic level reduced by 10. This could be classed as one of the most stressing Random Events. It requires thought and a lot of brainpower. When you get teleported to the Maze, you will arrive at the entrance. 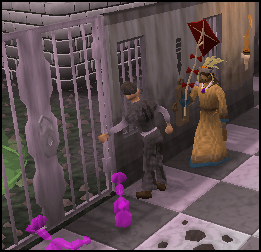 The Mysterious Old Man will be there to bank your items, and he may follow you around too. 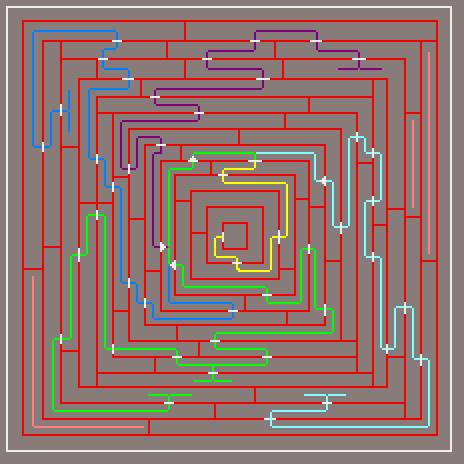 Now for the hard part - you have to get from the entrance of the Maze to the middle, where your reward is waiting for you. The quicker you get to the center of the Maze, the better your reward will be. Along the way, you may encounter some chests. Open them to receive additional rewards. When you've reached the center, touch the shrine. Upon doing so, you will receive your reward and will be teleported back to where you were before the event occurred. Ah! Another mysterious Old Man event strikes again. This time, he will teleport you to a stage, where you will find a mime next to you and a small audience. 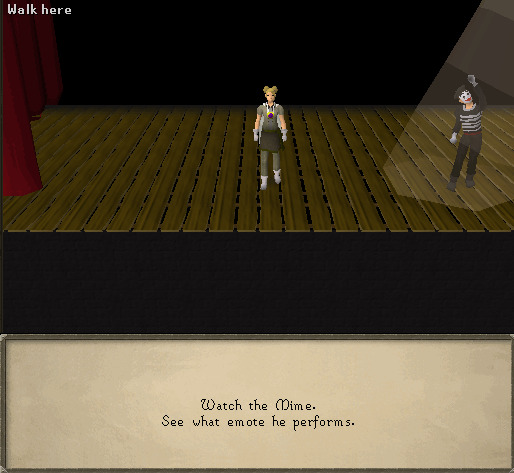 The goal of this random event is to copy what the mime does. He will perform a common emote and you have to try to find out which one it is. If you get it right, you will receive this message and perform the emote followed by a cheer. If you chose the wrong choice, however, you will have to continue and do an additional round. You will receive this message and do a cry emote. Choose 3 correct answers and you will be teleported back to your original location. If you didn't get the chance to see the mime's performance, don't panic; he will do another emote after a while without any penalty. 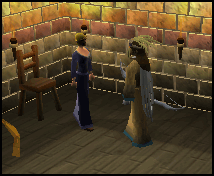 A Pillory Guard may suddenly transport you to a pillory in Yanille, Varrock, or Seer's Village. You will then find yourself locked in a cage with to move around, and a tramp throwing rotten tomatoes at you. To complete this event, you must open three locks. This event may be simple if you are patient. You have to look at the hole in the lock, and then choose the key with the corresponding shape to the hole. Beware; both the locks and the keys rotate fast. This is a random event in which the Mysterious Old Man will teleport you to an odd place where you will find two trolls and five different pillars which have a different type of rune on top (Nature, Fire, Water, Earth, and Air rune). To complete it, you must tag every pillar indicated by rings around it. When you tag a correct pillar (or post, be consistent!) you will receive one point. Once you have a score of ten points, you may leave. If you tag (consistency) the wrong pillar, your score will be reset to zero. To leave, go through the Cave Exit between the two trolls, Flippa and Tilt. Don't try to leave before you are done, since the trolls will hit you really hard! Another Evil Bob random event! 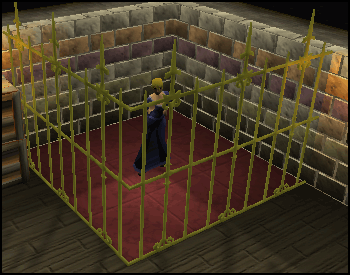 This time, Evil Bob will teleport you to a prison in ScapeRune. There you will meet Prison Pete. He will tell you that you have been captured and you can maybe get yourself and Prison Pete free from the prison. In order to do this, pull the lever to find out which balloon animal you must pop. 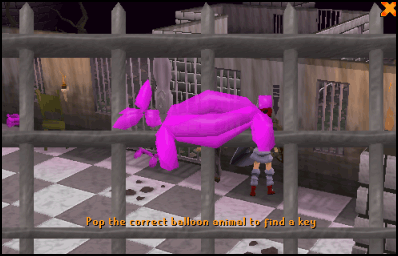 After locating the selected balloon animal, pop it and you will receive a key. 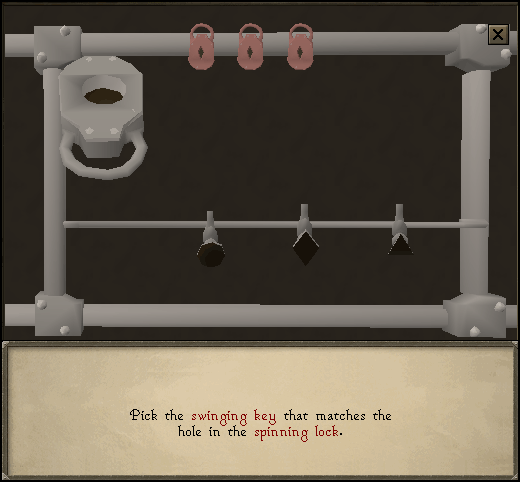 Use the key on Prison Pete to have him unlock one of the gates. Repeat this three times and you are set free and given a reward. Enter the portal to go back to your location. If you happen to miss give Prison Pete the wrong key, you have to do an additional lock. It's your lucky day! You have been teleported to a game show called "Odd One Out". The concept of this game is to pick the odd object that doesn't match with the other 2 items. If you happen to miss one, you will have to do an additional one. However, completing this event will teleport you back to your original location and will give you the chance of picking the Mystery Box as reward. 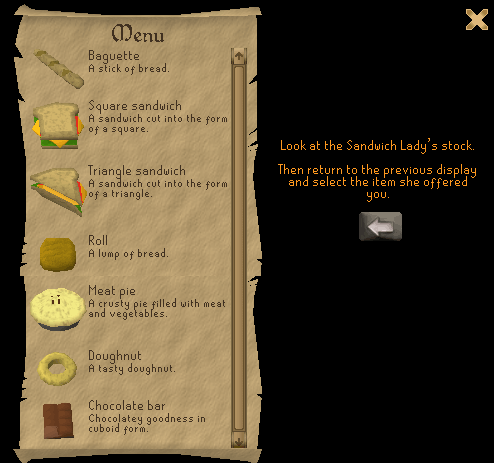 In this event, the Sandwich Lady will teleport you to her own diner. When you arrive, go talk to her. She will offer you a selection of food on a tray. You must pick the food that she desires for you to have. On the tray, there will be 7 kinds of food and near the top left, you will see a key. If you do not know which item goes with which food, this may be useful. If you pick the right selection of food, you get your reward and you can leave the diner by using the portal to the right. If you fail, however, you will be hit unconscious by her baguette and be sent to anywhere on RuneScape. 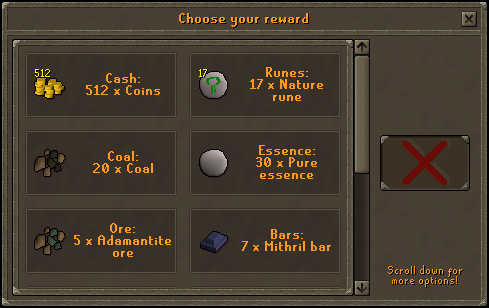 Note: If your inventory is full, there is a Bank Deposit Box which you can use. The Mysterious Old Man seems to think you are lacking in school. He will teleport you to a classroom full of monsters with a red dragon named Mr. Mordaut as teacher. The second type of question is more complex. He will present you with 15 items which are all random. You must choose three items which go with the clue on the right of the panel. Succeeding in answering 3 questions correctly will result in you getting your reward. Now, you must leave the classroom. You must leave through the door that Mr. Mordaut picks. The description could be a series of colors, shapes, directions, etc. 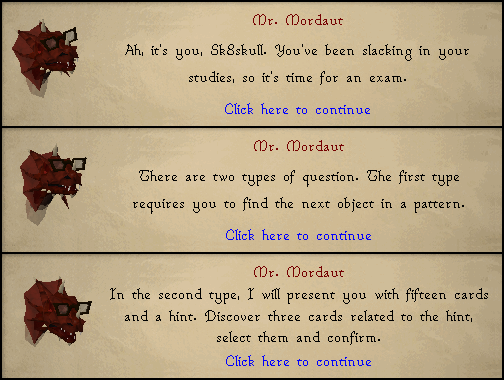 If you fail the second type of question too much, you will be teleported to a random place in RuneScape. If you fail the first type of question, you will have to do an additional question. 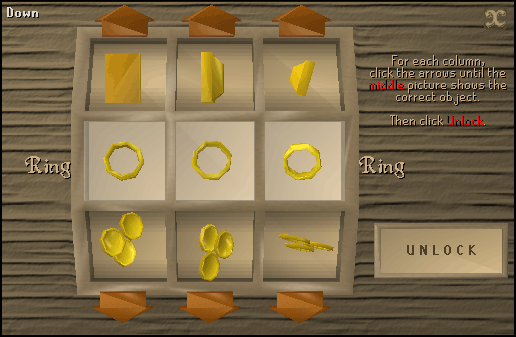 After successfully completing the random event, you will receive a random event gift box. When you open this box, you may receive various rewards. Some of these rewards might not seem too familiar to you. These are special items which you can only get from a Random Even Gift Box. Look below for a list and more details about them. 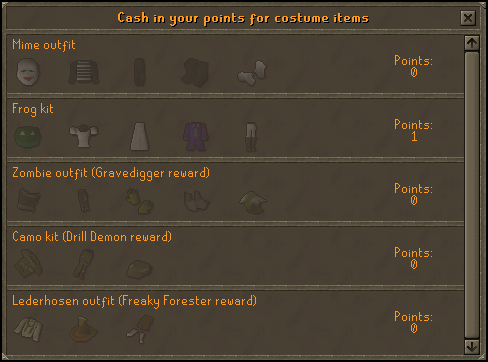 If you chose a Costume Point award, you will get a message asking you to go to Thessalia's Fine Clothes in Varrock. When you get there, talk to Iffie about costumes. You will then get a screen which lists what costumes you can get. Pick a costume and you will obtain it. Please note that you must complete the corresponding event to get the corresponding costume (i.e. Kiss the Frog event to get a Frog Princess blouse). One costume point gives you one piece of the costume. When completing a specific event, you may receive the chance to win a corresponding emote. If you choose the Genie Lamp, a Genie will come to deliver it to you. This lamp will grant you some free experience to any skill of your choice. If you choose the Book of Knowledge, the effect will be the same of the Genie Lamp, meaning you will get experience in a skill of your choice. However, the Book of Knowledge gives more experience than the lamp. You can only get this reward if you do the Surprise Exam event. Like the name says, this box is a real mystery! Choosing this box is a real gamble. You can get a range of nothing at all; to a valuable diamond! This section is dedicated to the old, removed events. As you may know, there were many random events that were removed. 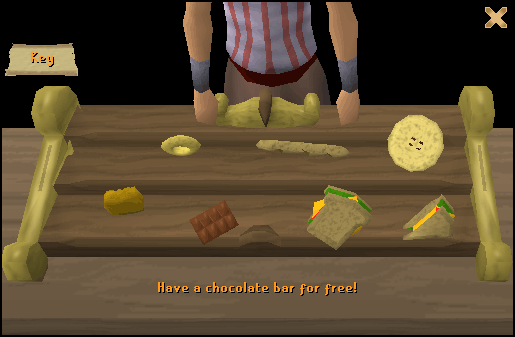 Random events, before, used to give a random reward at the end of a success. This was normally uncut gems or coins. 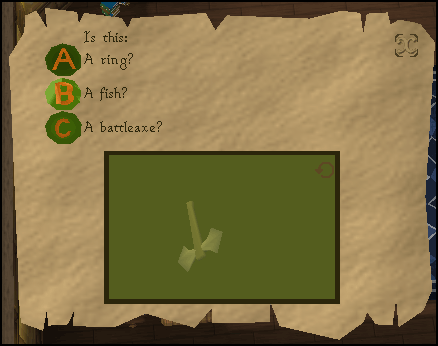 Random events used to be specified to a certain skill, such as a River Troll when you were fishing. 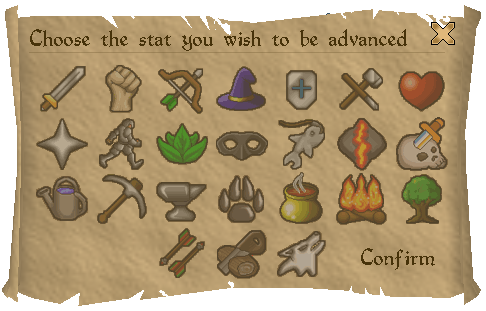 There also used to be a chance of dying from random events. These were called "dangerous" random events. However, you may still see these old random events. They can be found in odd places, like Rick Turpentine in the Port Sarim jail or the Tree Spirit, the Rock Golem and the River Troll in the Enchanted Valley. Here is a list of the removed random events which are now in the history books.